CDL-74441 Bert Kaempfert and his Orchestra. 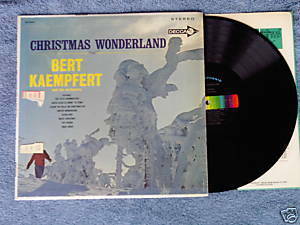 Christmas Wonderland LP. Includes Little Drummer Boy, Santa Claus Is Comin' to Town, I Heard the Bells on Christmas Day, Holiday for Bells, Winter Wonderland, Children's Christmas Dream. Recorded in Europe by Deutsche Grammophon/Polydor Series. Decca. Kaempfert and his orchestra make extensive use of trumpet and other horn instruments. Vinyl is VG/VG; cover protected by original shrink wrap is VG with remnant of retail tag affixed to front; inner sleeve features jackets of other Decca albums of 1960s.